One problem with old buildings is that they often struggle to accommodate modern IT infrastructures. This is an issue for any organisation, but even more so when its data management is evolving rapidly to meet the demands of its business. But there are solutions, and a prime example can be found at the Museum of Natural History Vienna, Austria. It's not just a showcase for precious minerals and rare fossils, but a base for more than 60 scientists who carry out important research and process large volumes of data. They need the storage and networking infrastructure to optimise their use of this data to keep the museum among the best in the world. As in any organisation, the demand for digital storage increased, to the point where the museum's data centre was almost full. The IT team had to find a solution which would also meet other priorities: reducing the amount of hardware they had to manage; cutting energy consumption; re-using as much of the existing IT as possible to control costs; and finding a replacement for the fibre channel storage area network (SAN) that was easier to manage. From an early stage they saw the virtualisation as an answer, as it could optimise the IT to make it responsive to future demands on storage, file sharing and security. After talking with a number of solution providers they decided to work with Dell, and less than a month later the company provided a detailed design for a virtualised IT environment using technologies based on the iSCSI standard for linking data storage facilities. One of the main achievements was to virtualise the server estate and reduce the number of physical machines in the data centre from 17 to just four. These run VMware vSphere virtualisation software and support about 25 virtual servers delivering applications such as Active Directory and Microsoft Exchanger Server. Storage is delivered by two iSCSI-based Dell EqualLogic storage area networks (SANs) that can handle up to 14TB of data combined. Robert Sailer, Head of IT at the Museum of Natural History, says it has been highly satisfied with the results. "The virtual machines are performing well," he says. "If there's an issue and we need to complete maintenance, I have the reassurance that I can move the virtual machines quickly between physical hosts using VMware vMotion. Employees are seeing maximum uptime." In addition, it has freed a lot of space, reduced energy consumption by about 60%, and provided an environment that can be quickly expanded. "We can add new virtual servers and provision storage in minutes," Sailer says. The move from fibre channel to iSCSI-based SANs has also reduced costs as the IT team no longer pays a third party to do some of the maintenance tasks, and does not have to upgrade storage controllers to support an expanded SAN. "When we had fibre channel, we had to hire storage specialists because we didn't have the experience, or even the time, to oversee the storage," Sailer says. "With Dell EqualLogic storage, we can scale our storage easily and manage the solution ourselves, helping us lower storage costs by around 60%." The addition of a third SAN is planned to increase capacity and support disk-to-disk tape backups. Reducing the number of physical servers and automating the SAN has also reduced management time by about 50%, and Sailer expects full payback on the investment within three years. 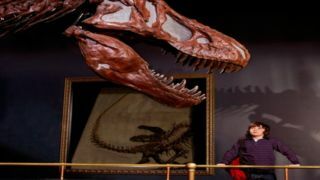 But more importantly, the scientists and administrators will be able to do their jobs effectively, and visitors will enjoy their time in the museum even more.